In the City of Takoma Park, zoning authority lies with the Montgomery County Planning Department. However, the City plays an important role in guiding the development review process. The flowchart to the right outlines an overview of the development process. A more detailed site plan application review process and timeline is summarized in this gantt chart. Montgomery County’s Development Review Manual (PDF) sets forth administrative standards for the timely and comprehensive review of and compliance with plans. 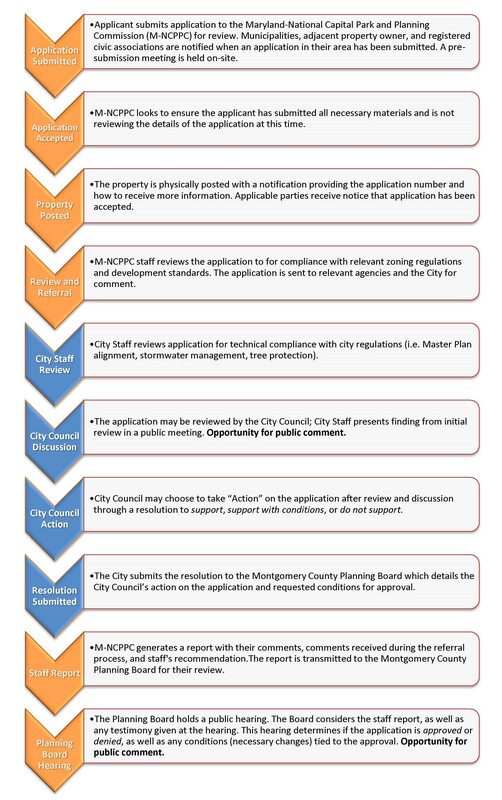 For information about how to get involved in Montgomery County’s Development Review process, check the County site. Information on the location, specifics, and status of active projects can be located using Montgomery County’s Development Finder. Pre-Application 720150050 415 Ethan Allen Avenue In Review Proposal to re-subdivide a lot and a part of another lot into two single-family lots. Preliminary Plan 120160170 430-434 Ethan Allen Avenue Approved (12/20/2018) Proposal to subdivide 3 existing lots into 5 new lots (2 existing houses, 3 proposed). Site Plan 820130080 6450 New Hampshire Avenue Approved with conditions (10/30/2014) Proposal to construct two-story commercial building. Preliminary Plan 120170120 Ethan Allen and Jackson Avenue Approved (01/25/2018) Proposal to subdivide 1 lot into 2 new lots. Council adopted Resolution 2017-32. Table: Development Review in Takoma Park. Details ongoing and recently approved projects in Takoma Park. Development and land use within the City of Takoma Park is governed by standards and guidelines adopted or enacted by the Takoma Park City Council, the Montgomery County Council, the Montgomery County Planning Board, and the State of Maryland. The implementation and application of these guidelines varies depending upon the scope of the project, its location, and the initiating party. The City and the Montgomery County Planning Board have a Memorandum of Understanding regarding development review (Resolution No. 2001-37). Guidelines for Construction and Renovation in Takoma Park: Creating a Sustainable Environment (1999). Holton Lane Area Improvement Vision (2009). Design Guidelines for Commercial Buildings in the City of Takoma Park (2011). New Hampshire Avenue Streetscape Standards (2014). State of Maryland’s Sustainable Communities Principles. City of Takoma Park Stormwater Ordinance. City Code Title 16: Stormwater Management. City of Takoma Park Tree and Vegetation Ordinance. City Code Title 12: Trees and Vegetation. A Historic Area Work Permit (HAWP) is required prior to undertaking any proposed changes to the exterior of a structure or to the environmental setting of a property within the historic district. This includes moving, demolishing or altering the exterior of a house, building or other structure. Applications are reviewed by the Montgomery County Historic Preservation Commission (HPC) and must be approved before a permit for the work may be issued. To search for properties listed in the located in the Historic District “Locational Atlas and Index of Historic Sites in Montgomery County” use the Historic Preservation Interactive Map. Changes to the exterior of any commercial property in the Takoma Park Historic District requires the approval by the City’s Facade Advisory Board (FAB) prior to review by the Historic Preservation Commission. Many commercial properties in Takoma Park are located in the Takoma Park/East Silver Spring commercial revitalization overlay zone (TPESS), which outlines special requirements and provides for development flexibility. The TPESS is detailed in Section 4.9.14 of the Montgomery County Zoning Ordinance (Chapter 59 of the Montgomery County Code). Montgomery County Planning Department also provides guidelines for preparing preliminary plans of subdivision and site plan applications for commercial properties if these are required.Prior to site plan submission, Montgomery County Planning Department will require a tree protection plan and stormwater management concept plan approved by City staff in the Public Works Department.